If you are unfamiliar with this day, go to the Blog4Peace website or the Blog4Peace FB page. One November 4th or each year, the web comes together, beyond religion, race or tribe, as one people to promote peace within us all. Naked and Hungry with joy and fellowship gladly BLOGBLAST for PEACE. 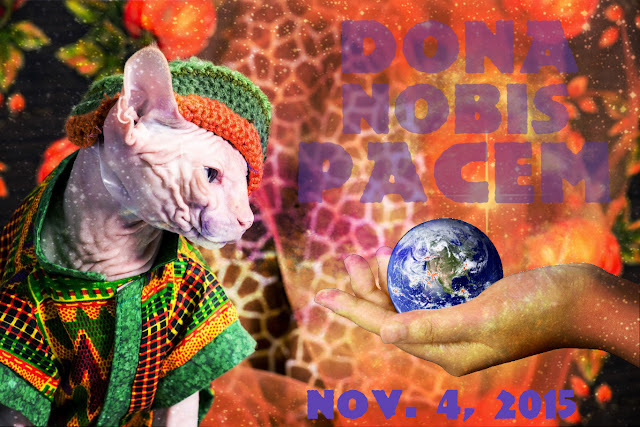 Your cat makes a wonderful spokescat for peace! I love his outfit.We live in a crazy world! I hope that you all find peace.